Create a file within a file using classification folders. Sturdy dividers with fasteners on both sides let you store information under several subdivisions in a single folder. Fasteners on the front and back panels add two more filing surfaces. The dividers have tabs for identifying subdivisions. 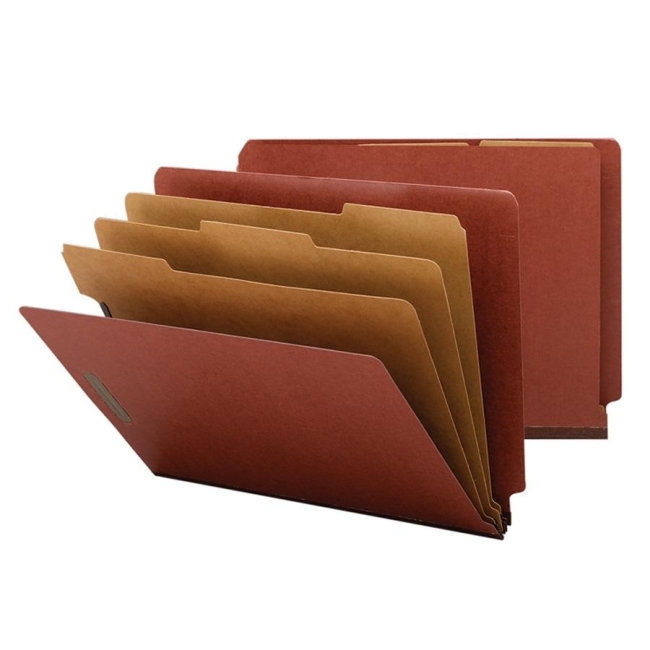 Perfect for project, personnel, real estate, accounting or banking files. Sturdy Tyvek gusset expands. Tabs are 3/4" wide. Top corners in front and back are rounded. Made of 25 point Pressboard stock. Folders offer 2" prong K-style fasteners in positions 1 and 3 (two per folder) and Tyvek tape in a matching color. Folders contain 60 percent recycled material and 30 percent post-consumer material. 1/3 cut tabs on dividers are 3/8" high. Dividers have a 1" twin-prong fastener in position 1. Dividers are made of 17 point stock and fully taped to gusset.